The 8,760-acre Needle's Eye Wilderness is cut in half by the Mescal Mountains. The southern boundary of the property is against the Gila River. In one area, the Gila threads its way through a spectacular steep-walled canyon so narrow it's called "Needle's Eye." In three segments of the canyon here the walls rise as much as 1,000' almost straight up. The area is bisected by several small slickrock side canyons that drop down into the dense riparian growth along the river. 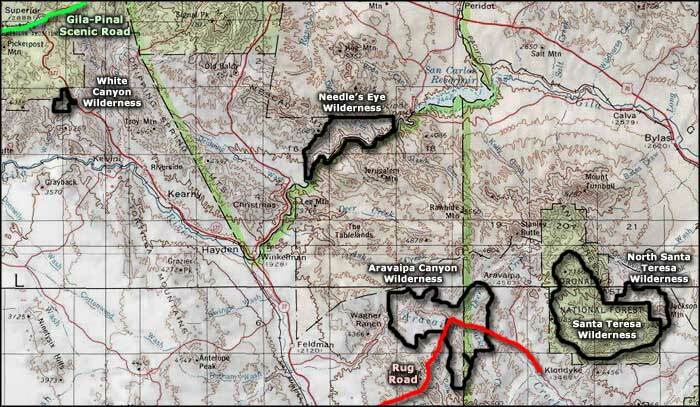 The Needle's Eye Wilderness is bounded north and south by the San Carlos Apache Indian Reservation, and bounded east and west by private land. Because there is no open public access, you'll need permission to access the property. If you get a recreation permit from the San Carlos Apache Indian Tribe, you can cross reservation lands east of Globe on Highway 70 and access the Needle's Eye Wilderness from either the Coolidge Dam or from Ranch Creek Road. But if you float down the river, the next exit point is Dripping Springs Wash, and you'll need advance permission from private landowners and from whoever holds the lease for the State Trust Lands there.